Powering the Planet with Energy Nanomaterials? How can nanomaterials make a difference in the grand challenge: efficient and green global scale production, storage and use of energy? Professor Geoffrey Ozin from the University of Toronto gives his response to this question. How can Nanochemistry help solve the energy problems that our world faces today? How can nanomaterials make a difference in the grand challenge: efficient and green global scale production, storage and use of energy? It turns out that depending on how energy is generated—by making or breaking chemical bonds, exciting electrons or holes, creating excitons or multiple excitons, using plasmons or phonons; the physical size of materials involved in the process can make a big difference as below a critical dimension the chemical and physical properties of materials are subject to quantum mechanical scaling laws. So why is small often good for many kinds of energy materials and devices? To answer this question we must understand the special properties of different classes of energy materials fashioned at the nanoscale and the role their size plays in energy or storage. A primary consequence of diminished size is to amplify surface effects, and morphology will determine the crystal faces available for surface reactions. By reducing the physical dimensions of energy materials to the scale of nanometres, the surface-to-volume ratio and number of active surface sites increase, which enhances the efficiency of any heterogeneous catalytic process whether thermo-, photo- or electro-catalytic. For energy materials, with physical dimensions smaller than the wavelength of electrons, holes or excitons, the beneficial effects of spatial and quantum confinement on electrical, optical, thermal and mechanical properties are becoming apparent in the fabrication of solar and fuel cell, lithium ion battery, supercapacitor, piezoelectric and thermoelectric energy devices. At these tiny scales, enhancing the absorption, diffusion and scattering lengths and strengths of all the various particles and quasi-particles which contribute to energy generation processes are of paramount importance in the production of efficient energy materials and their implementation in energy devices. I am really impressed by the many ways in which the unique properties of nanomaterials are being creatively applied to solve today’s energy problems. To amplify on the above with some representative examples, the intense electric fields associated with plasmons in silver and gold nanoparticles are being employed to enhance the harvesting of light, production of electrons and holes, and performance of metal oxide water splitting (α-Fe2O3 nanoparticles) and carbon dioxide recycling (TiO2 nanotubes) photocatalysts for the production of hydrogen, methane and methanol solar fuels. Noble metal nanoparticle plasmons are similarly being used for improving the light absorption and photon-to-electron conversion efficiency of different kinds of photovoltaics from silicon to dye-sensitized solar cells. In semiconductor nanocrystals, the effect of confinement of electrons and holes in a three-dimensional potential well is to transform the continuous energy levels of the electronic bands of the bulk semiconductor into discrete energy levels in the nanocrystal, whose energy spacing can be tuned by controlling the nanocrystal’s physical size. This so-called ‘quantum size effect’ in semiconductor nanocrystals can be usefully exploited in the construction of different kinds of solar cell, which take advantage of size-tuneable electronic band gaps to optimize the harvesting of solar photons; size-controllable electronic coupling between nanocrystals to enable efficient transportation and collection of charge; and multiple exciton generation from absorption of a single photon to maximize power conversion efficiency. Colloidally stable dispersions of semiconductor nanocrystals have the additional advantage that they can be readily combined with organic polymers, dyes or other nanocrystals and processed into thin films and multi-layers on rigid or flexible substrates such as metals, transparent conducting oxides or polymers, all key attributes for the development of third generation solar cells. In this context, the integration of photonic crystal architectures, such as those formed from multi-layers of colloidal nanocrystals, into solar cells has provided another means of improving their light collection and overall efficiency by increasing the effective path length and hence absorption of photons in the active semiconductor region of the device. In lithum ion batteries, metal oxide nanoparticles based on titania, silica or alumina are replacing organic plasticizers in polymer-salt electrolytes because of their ability to stabilize the room-temperature high-ionic-conductivity amorphous phase of the polymer and at the same time render the system less prone to explosion hazards during recycling. In this context, the deleterious charging–discharging volume swings of lithium ion battery anode and cathode materials, which occur due to intercalation of lithium ions at the negative electrode during charging and at the positive electrode during discharging, can be ameliorated by reducing their scale to nanometre dimensions with the additional benefit of improved cycling times. A notable accomplishment in this regard is the development of high-capacity silicon-based batteries which accommodate the substantial fourfold silicon anode volume changes on lithium insertion by fabricating the anode as an array of silicon nanowires, which provide small lithium ion diffusion lengths for rapid charge–discharge, nanowire conduits for transporting charge to current collectors as well as sufficient space in between nanowires to contain their volume expansion and contraction recycling requirements. The development of high-performance super-capacitors as electrical energy storage devices can also benefit from the use of high-surface-area electroactive nanomaterials. While the power density of super-capacitors is higher than that of batteries, their energy density (E = 1/2CV2 where C = capacitance and V = cell potential) needs to be improved for them to be widely deployed in electronic devices and industrial electrical systems. In this endeavour a notable research target is the high-energy-density asymmetric super-capacitor comprising a high-surface-area carbon cathode and a metal oxide anode. A recent promising example is an interpenetrating porous network of vanadium pentoxide nanoribbons and carbon nanotubes, which enables easy accessibility of an organic electrolyte and facile charge transport into the electroactive nanomaterial network. Reducing the scale of thermoelectric materials to the nanoscale provides a means of boosting the figure of merit (Z = σS2/κ where σ = electrical conductivity, κ = thermal conductivity, and S = Seebeck coefficient) to values in the range Z = 3-4 that make their use in power generating systems a realistic prospect. Bismuth-based nanomaterials—metal and metal chalcogenides in the form of dots, wires, sheets and assemblies thereof—can simultaneous display high electrical conductivity enabled by quantum size effects that enhance the electronic density-of-states and low thermal conductivity enabled through amplified surface phonon scattering effects. , which generate electricity from the application of pressure, notably from tiny movements of easily deformable nanowires grown on different substrates (fibres, meshes and films), allows them to be fashioned into new kinds of mechanically actuated nanogenerating power systems targeted for mobile, implantable and personal electronic devices. Here the electrical energy to drive the device is created by some form of physical motion of the zinc oxide nanowires, human or otherwise, originating in for example, sound, wind, heartbeat, muscle contraction and blood flow. It is the nanochemical techniques which have been developed and refined over the past two decades, which have led to our ability to produce these potentially groundbreaking energy materials and devices. Nanochemists have strived to produce nanoscale materials with controlled size and shape and surfaces and well-defined compositions, which are necessary for tackling these challenges. Although there is still a great deal of work to be done, we have come a very long way in a very short time. 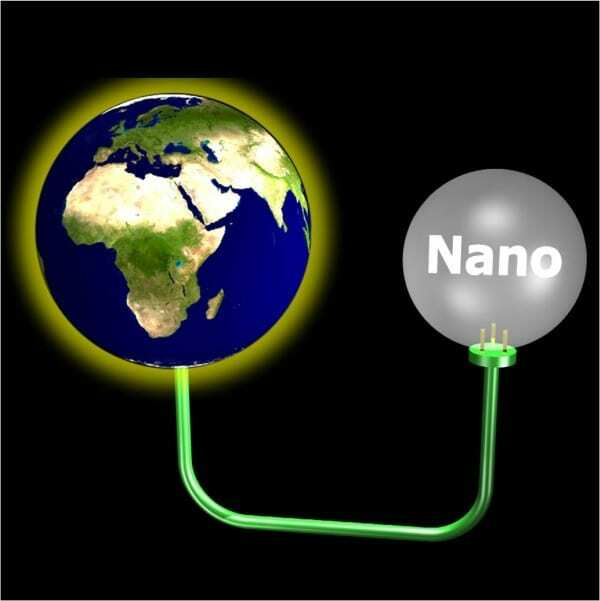 Now the challenge is to make the leap from nanoscience to nanoengineering; from the simple quest to discover and characterise new energy materials to the true goal of applying them in the solution of global energy problems, illustrated in the futuristic scheme of nanomaterials powering the planet! In the emerging field of enhanced energy nanomaterials, it has been the increasing application of nanochemistry synthetic strategies which has provided the enabling nanoscience that has led to the realization of improved-performance energy nanotechnologies.